This guide provides general answers to frequently asked questions regarding Driving Under the Influence (DUI) in Palm Beach County, Florida. 1 What is DUI or Driving Under the Influence? Driving Under the Influence, or DUI, is a criminal charge in Florida when a person is in actual, physical control of a vehicle while under the influence of drugs or alcohol to the extent their normal faculties (ability to walk, talk, see, hear, etc.) are impaired, or with a blood or breath alcohol content of more than .08. 2 What are Field Sobriety Exercises? Field Sobriety Exercises, or FSEs, are tasks designed to measure a person’s coordination, balance, and mental awareness. The roadside tasks are administered by law enforcement officers, in many cases an officer who is a member of a DUI Task Force, after a traffic stop (or at a DUI checkpoint) when the officers have reasonable suspicion that the driver of the vehicle is under the influence of alcohol or drugs. They usually consist of HGN (Horizontal Gaze Nystagmus – where an officer will ask you to follow a pen with your eyes), Walk and Turn (walk nine heel-to-toe steps in a straight line, turn around, and walk back), One Leg Stand (stand on one leg, lift the other leg approximately six inches off of the ground while keeping arms down at the side, and count to thirty), and Finger to Nose (extend the arms one at a time to touch the tip of the nose with the tip of the finger). 3 Do I have to perform Field Sobriety Exercises? Field sobriety exercises are voluntary. An officer’s request for a person to perform these exercises is his attempt to either dispel his belief that the suspect is under the influence, or to gain additional evidence in support of his belief that the driver should be placed under arrest. Typically, officers are recording these exercises with the dash camera in their police vehicles, and the resulting video evidence can be used in court. This is why it is important for people to know that a person who is requested to perform field sobriety tasks does not have to perform them. There are many reasons that a person could perform poorly on the exercises, even if that person is not under the influence. 4 Do I have to take a Breath Test? Florida’s implied consent laws provide that refusal to submit to a breath test can result in a 1 year drivers license suspension, or more, and the refusal to provide a breath sample can be used in a DUI trial as evidence of guilt. So while you can refuse to take a breath test, such a refusal will not be without consequences. 5 The police officer didn’t read me my rights – does my case get dropped? Unfortunately, it is not that easy. In Florida, an officer usually does not have to read your Miranda rights unless he is interrogating you, or unless you were involved in a car accident and his traffic investigation turns into a DUI investigation. This is why it is important for you to know your rights – including your right to remain silent. 6 What is the 10 Day Rule? When you are arrested for Driving Under the Influence in Florida, your DUI citation will act as a 10 day temporary driving permit. During that time, you have the option to request a Formal Review Hearing and challenge the administrative suspension of your license in front of a DMV hearing officer, or you can waive that right and immediately receive a hardship permit (also called a Business Purposes Only permit) which will let you drive for limited purposes (such as going to school or work). You have to make this decision within 10 days. 7 What is a Formal Review Hearing? A Formal Review Hearing is separate and distinct from the criminal DUI case. The purpose of a Formal Review Hearing is for a hearing officer, who works for the DMV, to make a determination as to whether the person’s civil license suspension should be sustained, amended or invalidated based upon the evidence presented. During the Formal Review Hearing, the hearing officer will determine 1) Whether the police officer had probable cause to believe that the driver was driving or in actual physical control of a motor vehicle in this state while under the influence of alcoholic beverages or chemical or controlled substances and 2) Whether the driver had an unlawful blood-alcohol level or breath-alcohol level of .08 or higher. The hearing officer will determine this by a “preponderance of the evidence,” meaning that if the hearing officer finds it is more likely than not that the driver was under the influence or had a BAC of .08 or higher, the driver’s license suspension will stay in effect. The police officer will typically testify during the hearing, and the police report will usually be introduced into evidence. All of which the driver is entitled to see. Formal Review Hearings give the driver an opportunity to not only fight the civil license suspension, but also to obtain testimony from the police officers involved in the arrest. 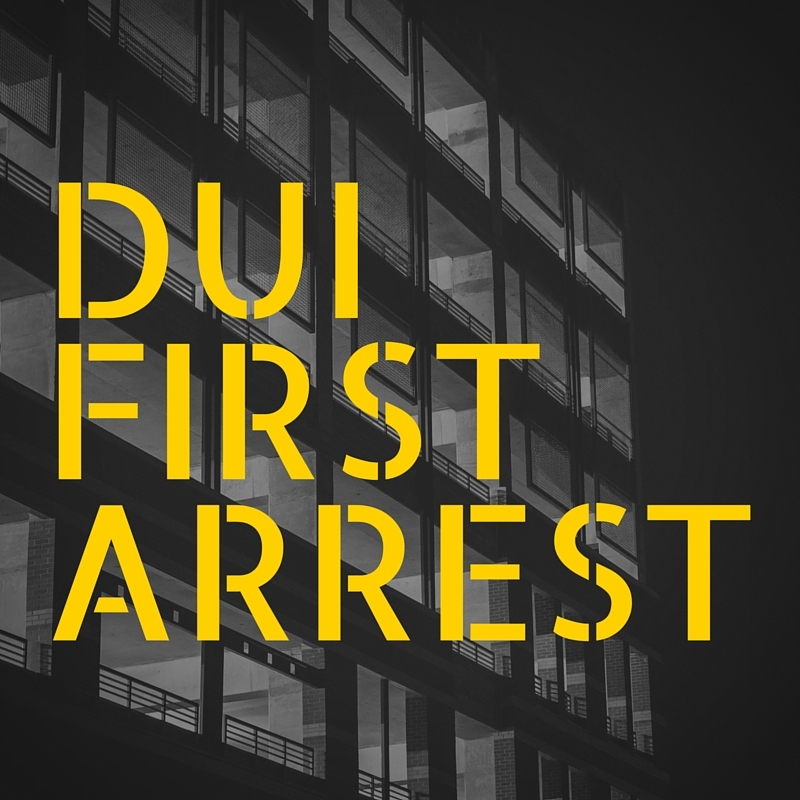 The penalties for a first time DUI arrest depend on the specific circumstances of the incident. In general, for a run of the mill DUI where there were no enhancing factors (no accident, no children in the car, blood or breath alcohol content under 1.5, etc. ), a person will be facing fines ranging from $500.00 up to $2,000.00, a minimum of six months driver’s license suspension, possible jail time, 10-day vehicle immobilization, at least 50 hours of community service, up to one year of probation, attendance at DUI school, and attendance at a Victim Impact Panel, in addition to higher insurance rates and a criminal conviction . 9 Is there a Diversion Program for 1st Time DUI arrests in Palm Beach County, Florida? Yes; in 2013 the Palm Beach County State Attorney’s office established a diversion program for people who are facing their first DUI arrests. Not everyone is eligible for the program: if you were in a DUI crash, or you were arrested for DUI with a minor child or animal in your car, the Palm Beach County prosecutors will not let you enroll in the Palm Beach County DUI First Time Offender Program. A person who is arrested for a DUI for the first time who does participate in the Palm Beach County DUI First Time Offender Program, which is a diversion program, can expect the following: the DUI charged will be dropped, you will instead plead guilty to a lesser charge of reckless driving, and then you will be placed on probation for 12 months, during which time you agree not to have alcohol or drugs, to immobilize your car for 10 days, to pay for an alcohol monitoring device (ignition interlock that is installed in your car, SCRAM – Secure Continuous Remote Alcohol Monitor – ankle bracelet monitor, or Visual alcohol monitoring device) for three to six months (the time period depends on the level of impairment), to pay a fine from $250.00 to $500.00 (depending on the level of impairment), to perform 50 or 75 community service hours (depending on the level of impairment), DUI school, substance abuse evaluation, and Victim Impact Panel class. It is important to know that there are severe consequences for failing, which can include a reinstatement of your DUI charge and conviction, and 90 days in Palm Beach County Jail. The program is not for everyone – you need to be extremely disciplined to pass the program. If you have been arrested for DUI in Palm Beach County, Florida, and are considering the DUI program, you need to act fast – if you want to enter the program, you have to do so at Arraignment. A knowledgeable DUI defense attorney in Palm Beach County will help you review your case and decide whether you should enter the Palm Beach County DUI First Time Offender Program. 10 Why Hire a DUI Lawyer in Palm Beach County? A DUI Lawyer in can review your Palm Beach County DUI case and look for mistakes that were made by the officers, challenge breath test results, file motions to suppress if needed, contest your DUI charges, and negotiate with the State on your behalf or go to trial. Anyone who is facing DUI charges in in Palm Beach County, Florida, whether it is the first time DUI charge or a second DUI charge or more, should contact a criminal defense attorney experienced in Driving Under the Influence charges to review the case for any possible defenses and help you find the best possible resolution to your specific case. Anyone who is facing DUI charges in in Palm Beach County, Florida, whether it is the first time DUI charge or a second DUI charge or more, should contact a criminal defense attorney experienced in Driving Under the Influence charges to review the case for any possible defenses. Casey Reiter is an attorney at Greenspoon Marder Law in West Palm Beach, Florida, practicing in the areas of Criminal Defense, Family Law, and Appellate Law. In the past, in Palm Beach County the answer to that question was unfortunately “No” for someone who was arrested for DUI. Palm Beach County first arrest DUIs would have to be fought in the normal way: taking depositions, filing motions to suppress evidence, going to trial, or accepting a plea offer. Now, however, the Palm Beach County State Attorney’s Office has created a Palm Beach County DUI First Time Offender Program. The Palm Beach County DUI First Time Offender Program began on June 1, 2013. While the requirements of the program are mostly tougher than the penalties for a first-time DUI conviction, signing up for and completing the program is worth the tough requirements for most people. A DUI conviction for a first-time DUI offender who does not participate in the Palm Beach County DUI First Time Offender Program can include: fines ranging from $500.00 up to $2,000.00 (the exact fine depends on the levels of impairment and other circumstances), a minimum of six months driver’s license suspension, possible jail time, 10-day vehicle immobilization, at least 50 hours of community service, up to one year of probation, attendance at DUI school, and attendance at a Victim Impact Panel, in addition to higher insurance rates and a criminal conviction on your record. A person who is arrested for a DUI for the first time who does participate in the Palm Beach County DUI First Time Offender Program, which is a diversion program, can expect the following: the DUI charged will be dropped, you will instead plead guilty to a lesser charge of reckless driving, and then you will be placed on probation for 12 months, during which time you agree not to have alcohol or drugs, to immobilize your car for 10 days, to pay for an alcohol monitoring device (ignition interlock that is installed in your car, SCRAM – Secure Continuous Remote Alcohol Monitor – ankle bracelet monitor, or Visual alcohol monitoring device) for three to six months (the time period depends on the level of impairment), to pay a fine from $250.00 to $500.00 (depending on the level of impairment), to perform 50 or 75 community service hours (depending on the level of impairment), DUI school, substance abuse evaluation, and Victim Impact Panel class. A lot of the requirements may sound the same. The biggest difference, aside from getting the DUI charge dropped, is that with the Palm Beach County DUI First Time Offender Program, you will be responsible to pay for your own alcohol monitoring device, which can get expensive. The ignition interlock costs nearly $100 to install and then over $70 a month to monitor; a SCRAM Monitor costs $100 to install and then a daily payment of over $10.00; the Visual Alcohol breath test monitor costs $50 to start then a daily payment of about $6.00. Each device has its own pros and cons, which a Palm Beach County DUI lawyer can help you weigh. But, with the chance at having a DUI charged dropped, the cost may be worth it to a lot of first offenders. Not everyone is eligible for the program: if you were in a DUI crash, or you were arrested for DUI with a minor child or animal in your car, the Palm Beach County prosecutors will not let you enroll in the Palm Beach County DUI First Time Offender Program. Also, anyone who is not dedicated to completing the program faces severe consequences for failing, which can include a reinstatement of your DUI charge and conviction, and 90 days in Palm Beach County Jail. The program is not for everyone – you need to be extremely disciplined to pass the program. If you have been arrested for DUI in Palm Beach County, Florida, and are considering the DUI program, you need to act fast – if you want to enter the program, you have to do so at Arraignment. A knowledgeable DUI defense attorney in Palm Beach County will help you review your case and decide whether you should enter the Palm Beach County DUI First Time Offender Program. DUI charges that involve a breathalyzer result over the legal limit often seem difficult, if not impossible, to beat. However, an experienced DUI defense attorney will know that there are certain things to look for that could possible lead to the suppression of the test. If the breathalyzer is suppressed, it is often much more difficult for the State to go forward with their charges. One possible defense is that the “20 minute observation period” was not properly followed. What is the 20 Minute Observation Period? In a Florida DUI case, when a person is requested to provide a breath sample using the breath machine called the Intoxilyzer 8000, there are certain rules that the police officers must follow in order for the breath sample to be valid. One of the requirements is what is known as a 20 Minute Observation Period. For a period of 20 minutes, the breath test operator must continuously observe the person giving the breath sample. This observation period is mandated by Rule 11B-8.007(3) of the Florida Administrative Code in order to ensure that person giving the breath sample has not taken anything by mouth, has not regurgitated for at least 20 minutes before administering a breath test, and to allow for any alcohol remaining in the mouth to disappear. Without waiting for 20 minutes, the breath test may be invalid due to alcohol in the mouth, instead of the breath, showing up on the test. There was recently a case in Florida where the breath test operator only observed the defendant for 17 minutes instead of the full 20 minutes. The defense filed a motion to suppress the results, arguing that 17 minutes was not sufficient to be in strict compliance with the requirements – and the trial court agreed. There have been many cases similar to that – including one where the Defendant was observed for 18 minutes and 23 seconds – where the court threw out the results. A knowledgeable criminal defense attorney will know how to read the breath results and what to look for to see whether the test was in compliance or not. A test that was not administered in accordance with the rules may be deemed inadmissible. Anyone who is facing DUI charges in Florida, including Palm Beach County, should contact a criminal defense attorney experienced in Driving Under the Influence charges to review the case for any possible defenses.